Chromosomal Proteins and Their Role in the Regulation of Gene Expression examines how chromosomal proteins take part in the regulation of gene expression. 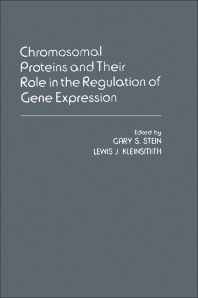 This book also looks at the variety of approaches that are used in studying the structural and functional properties of chromosomal proteins, particularly as they relate to the control of transcription. This text is organized into 15 chapters and begins by analyzing the regulation of histone gene expression during the cell cycle and the role of non-histone chromosomal proteins in such regulation. The following chapters focus on the in vitro transcription of the globin gene in mouse fetal liver chromatin; the involvement of non-histone proteins in both positive and negative controls of gene activity; and the role of phosphorylated proteins as regulators of gene activity. The discussion then shifts to the phosphorylation state of non-histone proteins and its correlation with gene transcription; changes in nuclear proteins during embryonic development and cellular differentiation; and the manner by which histones are deposited onto replicating chromosomes. This book also explains the histone methylation, specific phosphorylation sites in lysine rich (H1) histone, and the separation and characterization of nuclear non-histone proteins by means of DNA columns. This book is of interest to advanced undergraduate students, as well as to graduate students and researchers in genetics, cell biology, molecular biology, biochemistry, and microbiology. Do Phosphorylated Proteins Regulate Gene Activity?